Enter in your mobile phone number or e-mail address and we will notify you when g2 MicroSD Walkers Cay to Exuma Sound is back in stock. Bluechart g2 marine maps allow you to see your vessel's precise, on-chart position in relation to navaids, coastal features, anchorages, waterways, obstructions, restricted areas and more. Depending on which unit the card is plugged into, the following features may be available. Realistic navigation features showing everything from shaded depth contours and coastlines to spot soundings, navaids, port plans, wrecks, obstructions, intertidal zones, restricted areas, and IALA symbols. Smooth display presentation including seamless transitioning between zoom levels and more continuity across chart boundaries. Safety Depth settings lets you select up to five values for specific depth contour intervals. Fishing charts to help scope out bottom contours and depth soundings with less visual clutter on the display. Choice of standard 2D direct overhead or 3D "over the bow" map perspective to make chart reading and orientation easier. 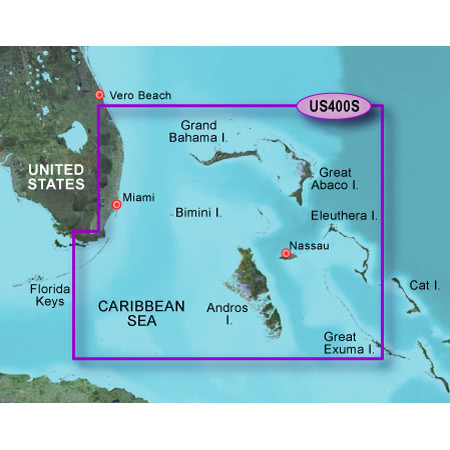 Detailed coverage of the Bahamas and the coast of Florida from Fort Pierce to Long Key. Also includes detailed coverage of Grand Bahama Island, Great Abaco Island, Eleuthera Island, and Andros Island. This version is supplied on MicroSD card, with an SD card adapter. Please check compatability with your unit with us. $336.00 In Stock: Ships Today! $274.00 In Stock: Ships Today! $299.00 In Stock: Ships Today! $239.00 In Stock: Ships Today! $359.00 In Stock: Ships Today! $49.00 In Stock: Ships Today!